Naples and Sicily, Drawn form the Best Authorities. 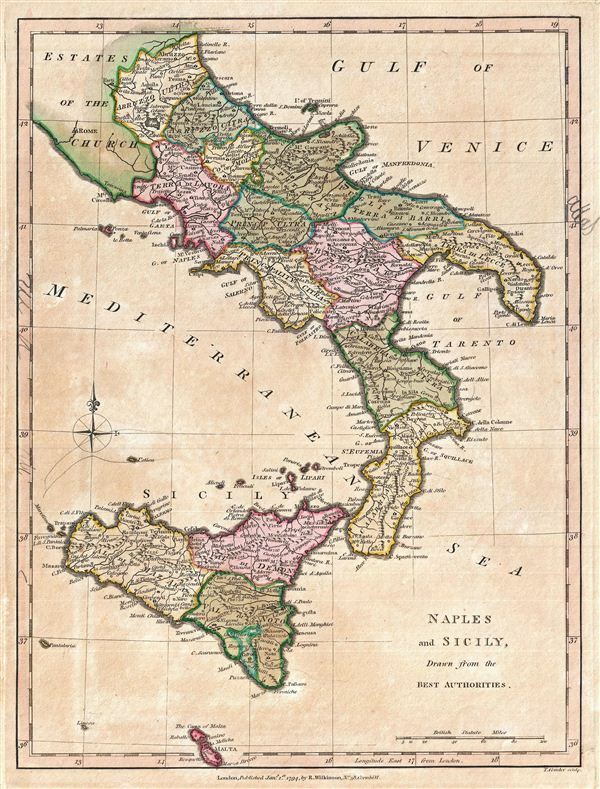 An exquisitely detailed first edition 1794 map of southern Italy by Robert Wilkinson. Wilkinson's map covers the territory claimed by the Kingdom of Naples, which extended from the Papal States south to include all of Sicily. Shortly after this map was issued Napoleon and the French Directorate would invade Italy, replacing the Napoli King, Ferdinand IV, with the short lived Parthenopaean Republic. Later Napoleon established the Kingdom of the Two Sicilies, which he gave to his sister Caroline and brother-in-law Joachim Murat. Ferdinand fled to the island of Sicily which remained nominally independent throughout the Napoleonic period. Though Napoleonic control of Italy lasted only until 1814, the brief period of unity inspired the Italian solidarity movement to follow. engraved by Thomas Condar for the 1794 first edition of Robert Wilkinson's General Atlas.